One of my husband’s colleagues gave him a promotion for a free week of Blue Apron. I’d read about Blue Apron before (primarily on the very awesome Amalah’s blog) and I figured the week of a new job was a great week to maybe have some low-stress meals to cook (plus, since my lunches come with my employment, I don’t need as many leftovers), so we kicked it off this week. BTW, tragically I’m waaaaay to small to be sponsored by anyone, so this post is entirely unsponsored. It’s really sad when you’re willing to sell your artistic soul, but there are no takers! 2) You stick it in your fridge. 3) For dinner, you pull out the gorgeous, full color recipe with detailed instructions and the corresponding ingredients and put them together. This may involve turning a radish into matchsticks, but perservere. 4) Twenty to thirty minutes later, you have a delicious, fresh, home-cooked meal in an innovative and very trendy recipe. I personally think it’s a brilliant idea. The meals are pricey for homecooked meals. I think they’re about $10 a meal a person, which is a lot. But if you’re replacing eating OUT with this, you could save a lot of money. The instructions demystify some of the cooking. And the ingredients are fresh and high quality. I was actually thinking it would be extra brilliant for people of means in food deserts. For example, my parents live in the boondocks, a 20 mile drive from the nearest grocery store. For the nearest grocery store with an ample produce department, it’s nearly 40 minutes drive. What if they got a box every week of healthy, simple, fresh meals? Then I remembered my dad hates vegetables. Oh well. Honestly, I was kind of excited about the whole thing. Adam and I love eating! And cooking! And eating what we cook! The first meal came out pretty well. Over our Pork and Tomatilla Pozole with hominy, avocado & radishes we talked about how such a great idea might fit into our lives. After much cogitation, I realized it doesn’t. Friday: Eat the delicious Blue Apron dinner we made for two, since through some amazing coincidence both children are elsewhere at dinner time. Saturday: Go to dinner with about 8 of our best friends while all of our children were at a YMCA kids night that I won in an auction in the winter. AWESOME. Sunday: Brother is here. Make world famous chili and cornbread since Blue Apron order only serves two grownups. Wednesday: Gaming night. Due to need to watch two (2) Deadliest Catch episodes (having missed one while in New York), I was tragically unable to prep ahead of time on Tuesday. Therefore the 10 people (6 adults, 4 kids) at the gaming table will have an unusually simple meal of buttermilk pancakes and bacon. Mmmmm bacon. Thursday: Maybe second Blue Apron meal? On any given week, I may serve neighbors, gamers, visitors, children. The food needs to create enough leftovers for lunches for three people for the entire week. (Not usually a problem.) And I reserve the right to at any moment say, “Hey, why don’t you come over for dinner? There’s plenty.” And mean it. Plenty of food in the pantry! You could tell me that tomorrow I was hosting 40 people for dinner, and I can’t go to the grocery store. Oh, and one of them is vegan, a second is gluten intolerant, and a third really likes top quality steak. And I could make enough (different) food for all of them to walk away regretting their thirds. The way I do this is with a vast pantry, a stand alone freezer, a farm share, and a dry good cabinet packet with pasta and beans. (I’d make Pav Bhaji for the vegan with a big pot of Basmati rice, which would coincidentally work just fine for the vegan too. Then I’d make a big pot of chili, and figure out how the heck to cook the frozen steaks from my meat share.) This philosophy paid off handsomely this winter when, despite incessant storms and consistently closed roads, I had something to bring to each potluck. Unfortunately, Grey has figured out that what gets put on the list gets purchased. See also: prime rib. The cat-heads veggie is the rarest and most delicious of them all! Probably the killing blow to the Blue Apron concept is the fact that in a few short weeks I’ll be swimming in arugula. And tomatillos. No one tell Dave about cactus leaves, since I’m still figuring out what to do with purslane. The producelanche works just fine with my Peapod/menu planning technique, especially when I time it right and do my order the night I get the produce in so I know what bizarre ingredients I need to find recipes for, like kohlrabi. (Just kidding. I never actually use the kohlrabi.) But you really don’t need a box of carefully curated veggie when you get a crate of garlic scapes the same day. And I actually prefer the garlic scapes, thanks. So to sum up, if you currently eat out a ton and/or live in a food desert and want to be a foodie, consider Blue Apron. 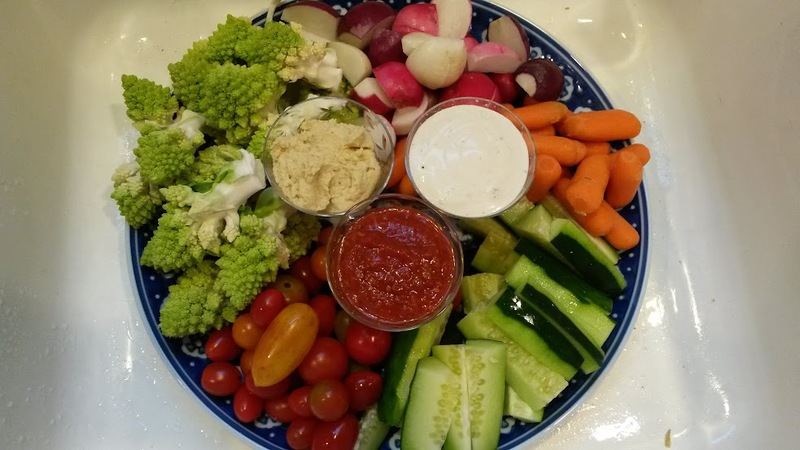 If you want to eat more vegetables (because you are afraid that if you don’t you may never find the back of your ‘fridge again) you should join a CSA like Farmer Dave’s. If you love eating but don’t need to spend 90 minutes a week with your friendly grocery baggers, online groceries are amazing. Finally, you should come to dinner sometime. There’s plenty. 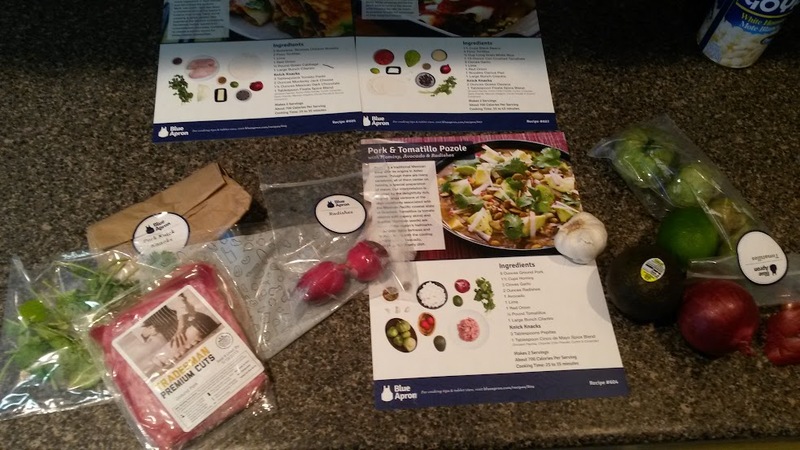 Funny – I just started using Blue Apron, last month and LOVE It. Though, I’m divorced and both my kids are grown, so I get three meals for 2, for the $59, and that is 6 dinners for me – perfect! The meals are delicious. I am cooking more, and my meals are now way better. I understand though, how this wouldn’t work for younger families on the go. But also, did you know that instead of getting 3 meals for 2, you can get 2 meals for 4 (more family friendly meals)? There are two options there, just thought I would point that out! I knew they had a family option, but I didn’t know it was two meals for four. I might have to think about that! If Blue Apron had existed in my single days, I might have tried it because cooking for one is hard – a lot of my recipes make 4-6 servings which is a lot of leftovers (and I’m not a fan of leftovers). However, now that there are two of us cooking is a lot more fun and the leftovers problem is entirely eradicated by my significant other. We do a similar meal planning for the week. Another factor is that we *finally* got a good grocery store. Delivery hasn’t made it here yet but it’s a significantly more pleasant shopping experience than it was in the past when I had to go to several soul-sucking stores. Still no CSA options, though we do have farmers markets. One of my favorite things about visiting after seeing all of you is the fact I get to play in your freezer and pantry and if lucky hit a farm share time. So much fun. p.s. raising purslane because I love it in salads. I finally signed up when I realized that it wasn’t the weeknight cooking that was killing me, it was the planning. As long as I already know what I’m going to cook, I don’t mind cooking dinner after work. This has been wonderful for that. And it’s been mostly good (there have been a few epic exceptions) – but we’re two adults. I’m not sure it would work as well with kids involved. I’ve made some stuff I know my younger self would have run screaming from. My kids are pretty good on the “eating what’s put before them” scale, but some of the recipes do seem a bit like a reach. And I’m not signing up for MORE hassle. I splurged on the year’s subscription because that got me access to archives. Which has been good for a few weeks where they’ve had some real wtf choices. Like the week based on bison steaks. Even if I could find those around here, I have other things I’d prefer to spend my money on. 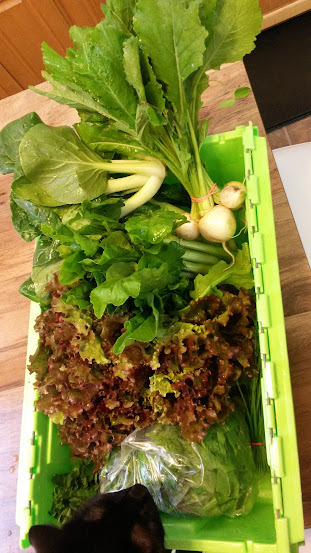 We joined a farm share for the farm next door to us a few years ago, but I was overwhelmed with leafy greens and romano beans and everything else was just not ample enough to make sufficient _anything_, let alone have enough to put up for the winter. I guess I was remembering the bumper crops of cucumbers, zucchini (always the zucchini) and most importantly, tomatoes of my youth. We used to have bushels of them, enough to make pickles, relish and tomato sauce for the year. Forget the arugula and tiny, perfect berries which are not enough to make 2 shortcakes — I was hoping for the basics, loads of them. Is Farmer Dave any different?